Datation : 12th century B.C., 13th century B.C. Category: Amulets. 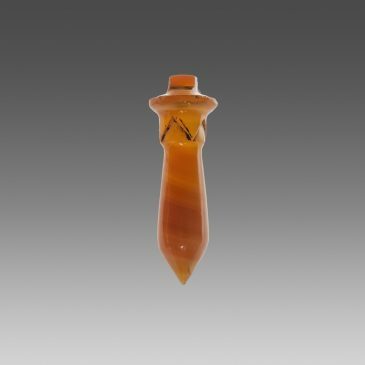 Tag: Necklace Bead in the shape of a Papyrus. 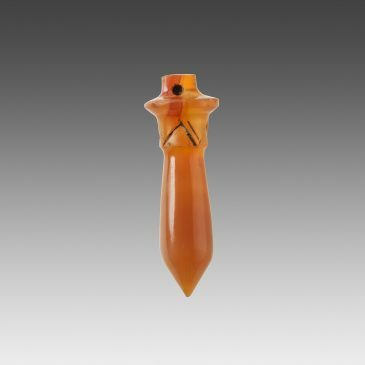 Carved in the shape of a stylized papyrus stem, it is pointed at the end. The suspension hole is pierced in the small cylindrical tenon that surmounts the object. In ancient Egypt, the papyrus stem was a symbol related to vegetation and therefore linked to fertility, rebirth and life after death. 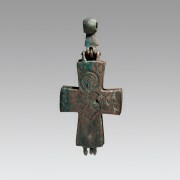 It also took the form of the wadj scepter (a hieroglyphic sign) that indicated the power and strength of eternal youth. 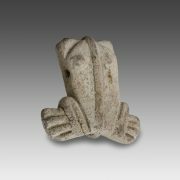 In the New Kingdom and later in the 1st millennium B.C., such amulets were very common, which attests their importance in the religious beliefs of the time. 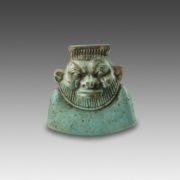 They exist in various materials, such as faience, gilded wood, hematite, steatite, etc. 12th century B.C., 13th century B.C. Complete and virtually intact; minor chips on the edge.